Marissa Carruthers surprisingly steps straight out of Vietnam into a French village during a visit to Ba Na Hills, near the city of Danang, Vietnam. 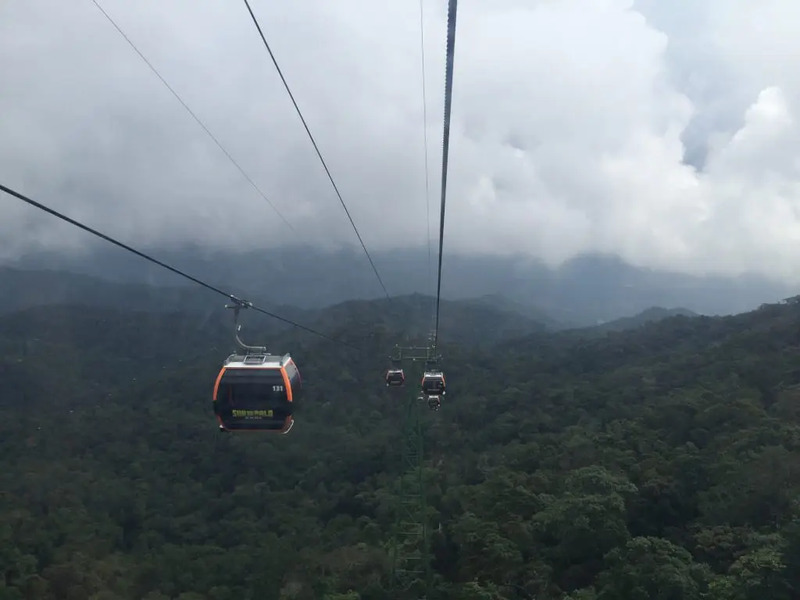 As we hop out of the cable car after a nail-biting 1,500-metre climb up Central Vietnam’s Ba Na Hills, we literally step into another world. The 7.30am sun that was already cracking the flagstones as we boarded was replaced with wisps of fog and clinging mist, a sharp chill stung the air and heavy grey clouds loomed above. But it wasn’t just the weather that changed. It seemed we had been transported straight out of Vietnam and into a quintessentially European town that wouldn’t seem amiss in the French Alps. I let out a snort of disbelief. 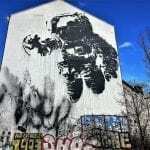 Disbelief that grew exponentially as we explored this bizarrely enthralling attraction. Narrow cobblestone lanes weave through rows of quaint European buildings, a cathedral stands as the centrepiece in the market square, musicians hailing from across Europe entertain on street corners and turreted medieval castles pierce the skyline. Founded by French colonialists in 1919, the former hill station served as a retreat from the heat below. It was once home to more than 200 villas, each affording sweeping views across the South China Sea or the parcels of countryside Central Vietnam is famous for. 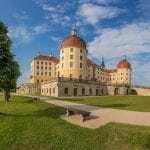 During decades of war, the resort was abandoned and quickly fell into a state of dilapidation. 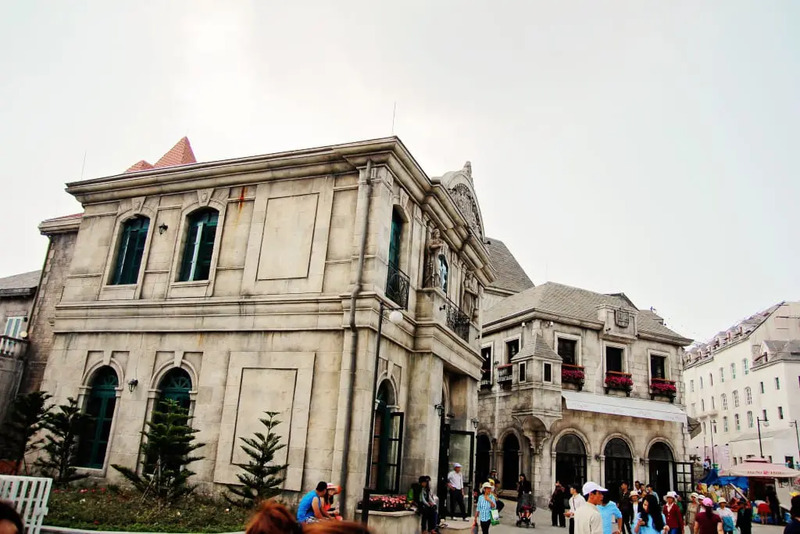 For many years, Ba Na hill station remained a relic left to fade in a forgotten past. 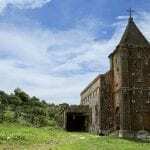 That is until recent years, when Vietnamese developers Sun Group set about creating the fairy-tale land that today sits atop the hill. If you’re an acrophobe like me – I struggle to climb up a few steps of a ladder – then getting to the hilltop is a feat within itself. 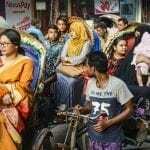 We’d arrived early to avoid the queues that I’m told quickly mount throughout the morning as masses of tour buses land – I was also advised to steer clear during summer and public holidays when local families flock there, making it at times unbearable to navigate. After buying our tickets, we stepped straight onto one of the snazzy-looking cable cars making their way up the mountain slope. Slightly putting my racing mind at ease was the fact they all looked new and pretty high-tech. Sensing my fear, an attendant reassured me I was safe, telling me the system was built to European standards by leading global cable car manufacturers Doppelmayr. She also steered me towards a cabinet swelling with Guinness World Records the cable car system has claimed since starting in 2013. The longest one-wire sling, the greatest elevation between stations, the longest unpatched wire and the heaviest cable roll in the world. All of this did little to calm my pounding heart; nor did the presumably soothing classical music played into our car throughout the journey. Surprisingly, the ride was smooth and after a couple of minutes of keeping my eyes tightly shut, I open them to be rewarded. As we glided upwards, the urban sprawl of nearby Danang shrank until it melted into a blob swimming in a sea of surrounding green. A patchwork of paddies slipped into the horizon and the lush tree-hugged mountainous terrain provided a carpet hovering beneath our feet. Distracted by the sweeping vistas that surrounded me, I forgot my fear and lapped up the changing landscape as we spent about 20 minutes climbing towards the clouds. Our first port of call was the Golden Bridge. 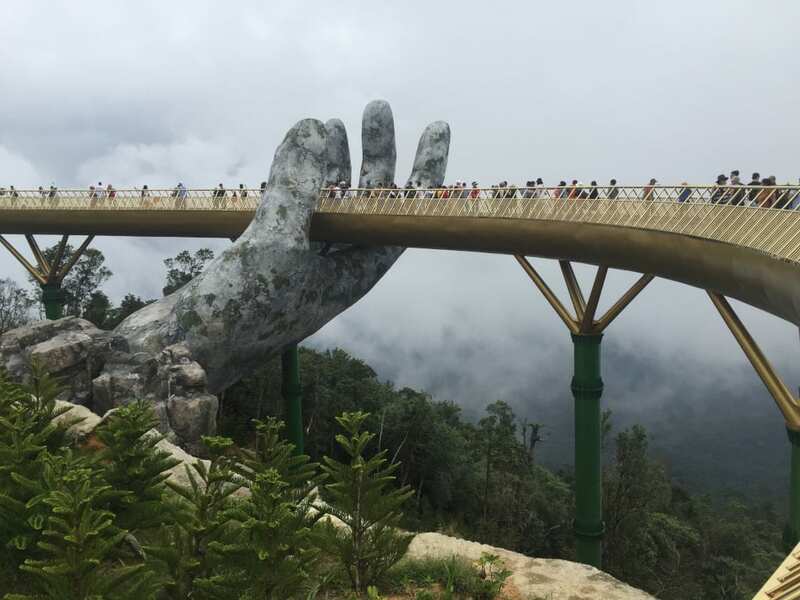 Since opening in June, the bridge – known locally as Cau Vang – has hit international headlines and attracted scores of tourists wanting to admire its unique architecture. Standing at 1,414 metres above sea level, the 150-metre pedestrian walkway resembles a golden sash being lifted from the clouds by two colossal hands carved from stone. 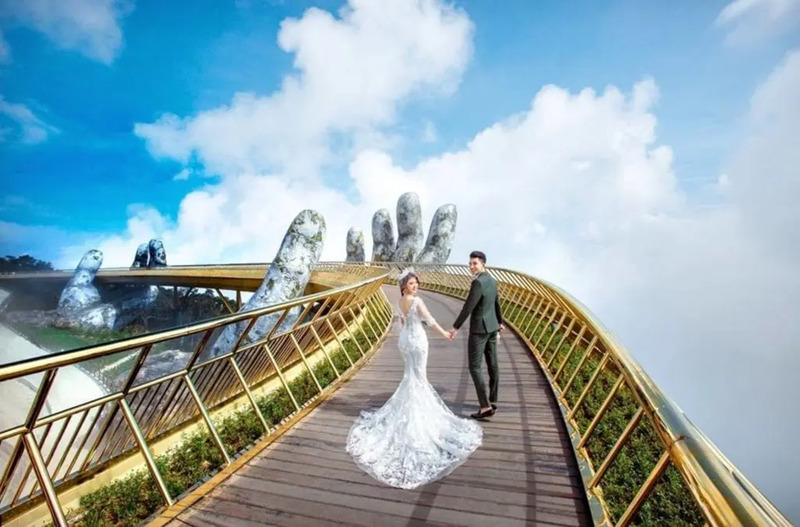 The bridge’s head architect Vu Viet Anh, design principal at TA Landscape Architecture in Ho Chi Minh City, said he wanted to create the mirage of the “giant hands of God, pulling a strip of gold out of the land”. As a storm brewed above and the fog billowed below us, it certainly felt as though we were walking on clouds while we made our way across the bridge, able to catch the occasional glimpse of the stunning panoramas shrouded by a thick cloak of mist. Of course, the bridge’s celebrity status makes it impossible to navigate without pushing past a barrage of selfie-sticks and pouting posers. Next up was Le Jardin D’Amour Gardens, a collection of nine perfectly-manicured gardens, each carrying a theme, from colourful rose gardens and labyrinths to the elegant Love and Eden gardens. Each is sprinkled with statues and sculptures that evoke a sense of colonial France. Nearby sit a giant 27-metre statue of Buddha and Linh Ung Pagoda, which along with its sister pagodas in Marble Mountains and Son Tra Peninsula, form a triangle that is believed to protect the city of Danang. The rain that had been threatening all morning kept up its promise as we finished strolling around the gardens, cutting short our trip to the pagoda. Instead, we hurried to the funicular station to ride to the site’s amusement park and French Village. Having survived the cable car, this should have been a breeze. But the carriage seemed to hurtle down the steep slope. The rain battered against the windows and the enveloping fog created a tightening sense of claustrophobia. Thankfully, it only lasted five minutes. We disembarked in the French Village, a quarter recreated to resemble, well, an early 20th century French village. We wandered along the cobbled streets, the handful of Europeans among us marvelling at the spectacle unfolding in front of us. Vietnamese newly-weds dressed in traditional white wedding attire braved the weather – which was even mocking a European summer – to stand on the steps of a sandstone cathedral for their wedding photos and Asian tourists snapped selfies in front of the streets full of olde worlde inns and boutiques. Overwhelmed by it all, we decided to cash in our free voucher at the Beer Plaza. Entering with images of a cosy tavern with a fire roaring in the corner in my mind, instead I was greeted with a giant air-conditioned – despite the dipping temperature outside – three-storey dome, designed to resemble a beer barrel. Long escalators take visitors down into the depths of the “barrel”, with a huge stage on the second level overlooking an even larger dance floor. To my surprise, despite it only just passing noon, the hundreds of tables and chairs were filled with beer-swigging tourists. And the dancefloor was packed with delirious visitors dancing along to a dungaree-clad Eastern European band blasting out traditional tunes. I took a swig of my mediocre beer and tried to take in my surreal surroundings, unaware it was about to step up a notch. 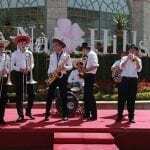 As the band retired from the stage, the tempo stepped up several beats as a troupe of dancers straight out of Rio Carnival skipped onto the stage. Suddenly it became all shaking booties and colourful feather headdresses. We ordered a beer tower. The fun doesn’t stop here. Next to the French Village sits Fantasy Park, an amusement park with plenty to do. Ba Na Hills Wax Museum is filled with international celebrities, ranging from Mr Bean and David Beckham, to Michael Jackson and Angelina Jolie. The Alpine Coaster isn’t something I tried but is a rollercoaster-style track that skirts above the treetops. The self-controlled cars can hit speeds of 24mph but come with brakes, so you can go as fast or slow as you want. 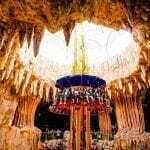 Fantasy Park itself is inspired by the novels Journey to the Centre of the Earth and Twenty Thousand Leagues Under the Sea by French author Jules Verne. It features three levels of games, rides and activities. The hair-raising Drop Tower sees riders taken up to a glass dome that affords fantastic views. However, you only get a quick chance to enjoy them before being dropped 29 metres into a mock cave. 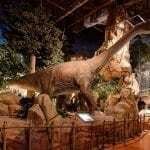 A Dinosaur Park features a range of replicas of the ancient beasts and there are also 3D, 4D and 5D film centres. 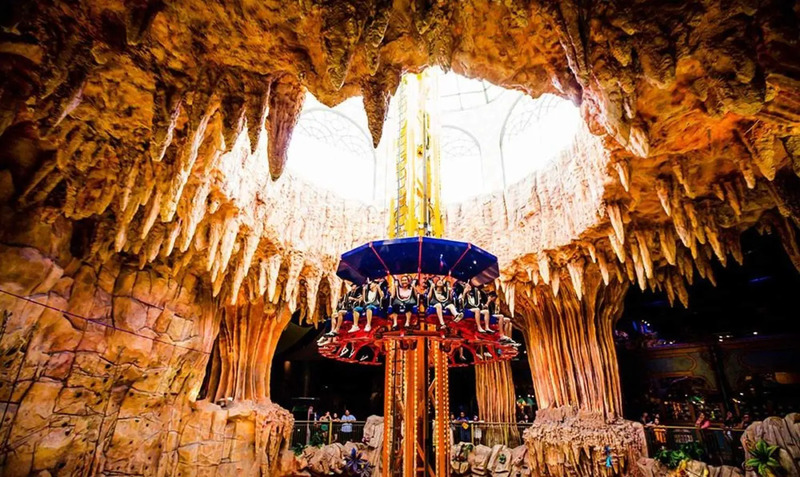 If you need more to keep you entertained, then get lost in the mirror maze, battle it out on the dodgems, take to the 21-metre climbing wall, or feast on food from all corners of the globe in the many restaurants and diners that dot the resort. With all of my senses well and truly titillated, my fear of heights didn’t even register as we made our way down the mountain, crossing gushing waterfalls and deep gorges, once again sitting in awe of those views. Even if it’s just for the views, a trip to Ba Na Hills is worth it – although be warned, its misplaced charm is bound to lure you in for more. A cable car ticket is 650,000VND ($29). Children from 1 metre to 1.3 metres tall pay 550,000VND ($24). Children under 1 metre get free entry. The ticket includes a return cable car ride and admission to the complex and Fantasy Park. Entry to the Wax Museum is 100,000VND ($5). Ba Na Hills Gateway – where you purchase tickets and board the cable cars from – is about 25km from Danang. Taxi is the easiest way to get there – about 45 minutes – and the driver will wait for you at the base. Negotiate a fee ahead of your trip. Depending on your skills, this can be between 500,000VND ($22) and 900,000VND ($53). Pack sunscreen, a jumper and an umbrella because the weather is unpredictable. 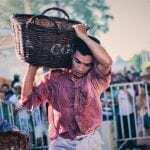 There is also a four-star Mercure hotel located in the French Village for those wanting to spend the night in a faux French village atop a Vietnamese mountain. Click here to visit the Ba Na Hills website.